So much yarn, so little time. : Mystery object, can you help? I bought this little chap from ebay years ago. The seller had no idea what it was, and I've tried and tried to find out. He has been very useful during my former career as a primary teacher. One of the hardest tasks is to make children think, so I had regular sessions where I would challenge them to investigate a mystery object. Early ideas would be limited to "it's wood", but as they got accustomed to the task my groups of 7/8/9/10 year-olds discovered more and more, and learnt to challenge their own (and more easily, each others!) ideas. A common suggestion was that it as a wine stopper (own up - how many of you were thinking just that?) Certainly the shape looks similar - but would you want bare wood in contact with your wine? How could it be cleaned sufficiently? Some children suggested it was Chinese, it reminded them of Chinese New Year dragons. One child said it might slot into the top of a bureau, with a matching creature at the other end. Often we talked about legends and belief systems, as it remnded us of mythical beasts. We often talked about who might have made it. Obviously somebody skilled, somebody who owned (or had access to) decent tools, somebody with leisure time (as it didn't seem to be functional). And at the end of a lesson, they always wanted to know the "right" answer. The most important lesson of all happened then - because I don't know what it is. Do you? 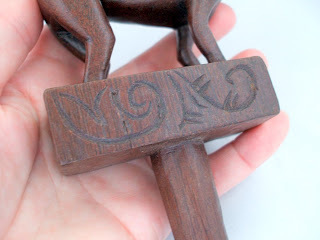 It's about 6" (15cm) tall including the peg at the bottom and is carved from a single piece of wood. The peg and underneath the base are much more roughly carved. There are decorative swirls (which some thought of as runes) on the base. you got me, that was my thought...and i don't have another one. What a great oddity. I have no idea what it may be but it is very interesting looking! I know I know, it's a wooden creature that goes in a thing. . . Sorry that was very not helpful but couldn't resist. A fantastic oddity indeed and one I would have needed for myself as well. Here's hoping you find the answer to this riddle. I agree - but what is it *for*? It's not cmfortable to hold (some kids thought it might be a walking stick top until I got them to grasp the spiky top) and of course it doesn't stand up. The peg must fit into somehting, somehow... I'd love to see your pics, Missmakesstuff. It reminded me of a finial, like the ones on iron gates or cupola's. 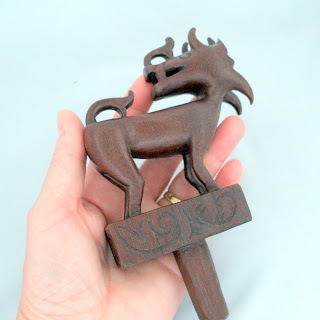 I found a brass finial on a site I use to research the vintage things I pickup. 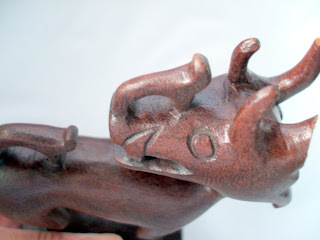 The carving, dragon I think, is similar, and maybe gives an idea of what it was. good luck in your quest. I am really curious to know what it is! 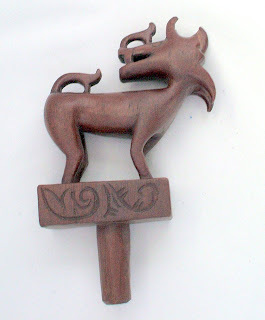 It looks very like the nordic carvings that I have seen in Norway, and could be a finial, but it looks to me like it is meant to be held by the loops on the nose and tail, with other fingers resting in the cups made by the horns on the head and below the chin. If it is meant to be held this way I think it only deepens the mystery...! interesting thoughts goodlife! I wish I could pas it through the screen for people to touch and hold, it's very tactile. It's actually quite comfortable to hold as you describe, with my index finger in the cup formed over the head, my second finger and others curled around and under the head. But the loops are much too small to get a finger through.